In the recent years, parents and teachers have been lamenting about the dearth of materials to help them explain and impart values to young children. The Values Wordsearch Puzzlegame meets this need! It is fun and educational! This is the first game of its kind set up especially for small children, ages 4-7, to help them understand words which are related to values. This game does not preach. It teaches! It is not a "rock 'em sock 'em game helping youngsters destroy aliens from another planet. We have let other companies produce those games. 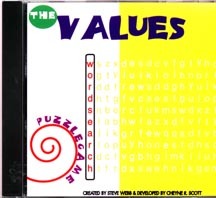 The Values Wordsearch Puzzlegame helps youngsters build within themselves a clear understanding of values which will help them live productively on this planet and beyond. This game can be played with or without assistance of an adult. This game can be played individually or with others. Each word has a definition, a scenario showing the word used in a positive situation (positive scenario), and a scenario showing the word used in a negative situation (negative scenario). These scenarios help children see the word used in context. Furthermore, lessons are taught in the scenarios, lessons parents, grandparents, and caregivers can use. Words are used which can be understood by little ones but sophisticated enough to stimulate their desire to increase their vocabulary. Mr. Webb is a resident of Ypsilanti, MI and father of four . He has worked for over fifteen years in an automotive plant. As a father, he wanted to find a way to teach values and vocabulary to small children without preaching. He wanted to make the learning experience fun. Ms. Scott was a sophomore at Father Gabriel Richard High School (Ann Arbor, MI) when she developed this CD. One of her hobbies is developing computer games. Furthermore, her work with children in various babysitting and daycare settings has given her a clear understanding of how youngsters learn vocabulary and how to be social with one another. Thus, she used 1-1/2 years to put together her knowledge of children and computers to develop this game totally by herself.